Mr Lorenzo Magnani paced back and forth, his beret slightly askew, holding his hands behind his back and occasionally stopping for a dissatisfied glance down that stretch of the San Donato street over which the doors and windows of his family homes looked out. As far as the family was concerned, from an economic point of view at least, he certainly could not complain; his was probably the wealthiest family in Bologna. It owned farmland far and near, as well as farms, and cultivated hemp for cords and sails used by the Venice Arsenal; and long rows of mulberry trees whose leaves fed the fat silkworms which provided lace and crochets and starched collars and embroidered shawls to gentlewomen on either side of the Alps, and the precious ecclesiastical garments to the Vatican’s clergy. All this meant wealth. He was less fortunate with health, having lost seven children one after the other, with the Studio’s doctors only able to suggest entirely useless potions or blood-letting. Moreover, there was that continual humiliation: for some seventy years the family’s coat of arms had been removed from the headboards of the seats where Bologna’s Senate met. The Magnani family (the name they carried suggested in itself a humble origin; for centuries magnano had meant smith, blacksmith or merchant in iron tools). It was true of course that the Magnani family, loyal supporters of the powerful Bentivoglio family, had become senators for just one year, between 1511 and 1513, when the Bentivoglio henchmen had returned to Bologna after having been ingloriously thrown out by Pope Julius II della Rovere. And it was also true that their men had thoroughly ransacked the Palazzo dei Marescalchi, on the Barberie road, in revenge for the complete destruction of the splendid Bentivoglio residence on Via San Donato, a little further on from the place where Mr Lorenzo Magnani was walking that day. And he thought: No not Senators, at least not for the moment, but definitely richer than anyone else. He was accompanied in his musings by Architect Domenico Tibaldi and a little further on by some of his carpenters and stone masons. Further down, next to the front door, a couple of lackeys stood, motionless, awaiting orders. Appropriate arrangements had been made with the Pannolini family and others from the neighbourhood . And some of the older, more rundown buildings had been razed to the ground, on Tibaldi’s advice. They had saved just two or three spiral columns, in specially curved brick, which had been moulded with a certain grace about a hundred years earlier. But at that time, at the beginning of the century’s eighth decade and almost seventy years after being thrown out of the Senate’s halls, everything else – the Magnani family’s modern new palazzo – still needed to be built. The architect tried to clear the clouds from that noble brain of his, in order to speed up the start of works. 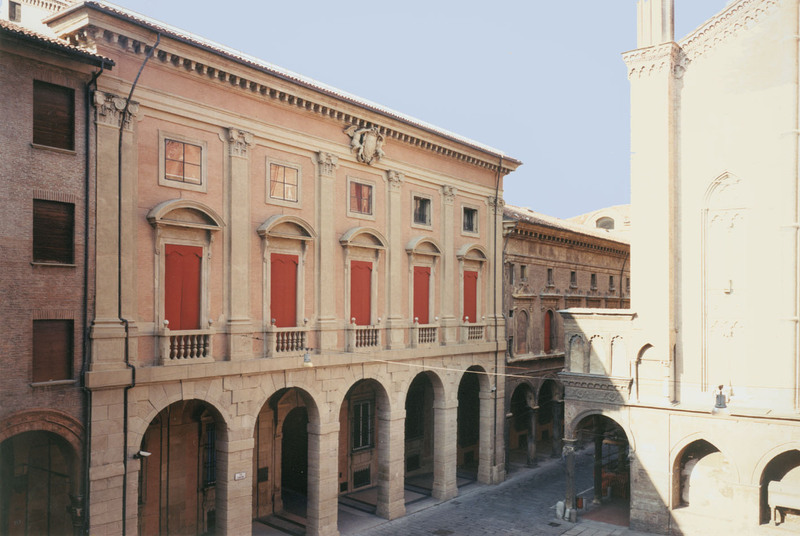 He pointed out that, almost uniquely, the new palazzo – adjacent to the Benedictine church of St. James (San Giacomo) whose jewel was the private Bentivoglio chapel with all of their portraits which had been painted by Lorenzo Costa – would have a vast, empty space in front of it, a piazza. And right there, flush with the facade, stretched that large square of uncultivated land where for centuries the Benedictines had buried their brothers and which Tibaldi had said someone would one day pave properly, perhaps bordering it in kerb stones (which did in fact occur). And everything was indeed done in a hurry. After the contracts with the gravel, cement and cut stone transporters had been signed, the beautiful façade was erected using fine quality brick surrounded by chiselled stone and topped by the family coat of arms, featuring its two-headed black eagle on the summit of a post with wings spread. Lorenzo Magnani, still devoid of any title, had it proudly written on an oval plaque that the palazzo had been started and completed within the space of just two years, between 1577 and 1589, for the convenience of the heirs and as an ornament to the city. The walls had been finished, but it was now necessary to add the best decorations that Bologna’s artists could devise. 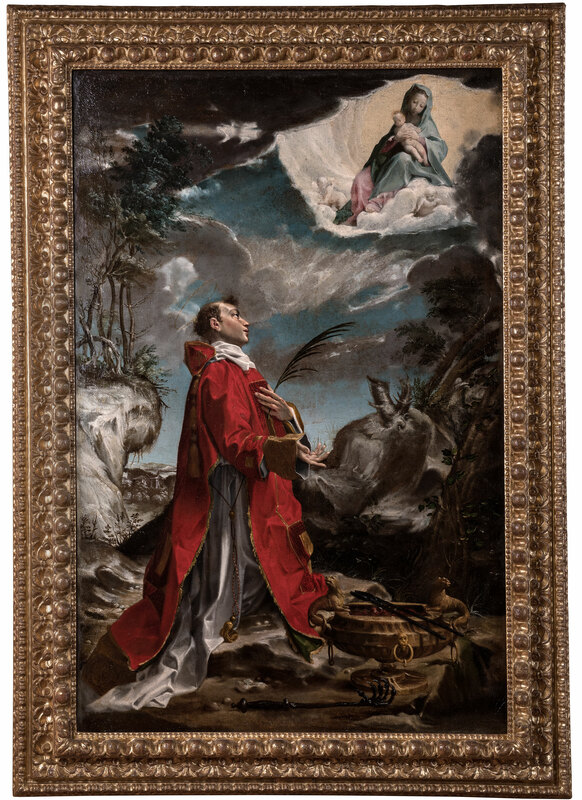 In fact, work continued until the death of Lorenzo Magnani who, satisfied, breathed his last in 1604. Meanwhile, the dynamic new Franciscan Pope Sixtus V had increased the number of Senate members from forty to fifty and the coveted dignity of Senator was granted to Lorenzo Magnani, who thereupon also became Count and Marquis. Those were glorious years for the Papal States: only a little unfaithful to Michelangelo’s project, Pope Sixtus had the dome of St Peter’s built and moreover had the great obelisk in the centre of Piazza San Pietro erected, using machinery which was highly complex for its time. In all likelihood, it seems that the large, beautiful frieze by the three Carracci, running all along the top of the Main Hall is a homage to Pope Sixtus V in thanks for the Senatorial dignity bestowed. As we know, the story portrayed follows the myth of the birth of Rome from its very inception, portraying the twins protected and nourished by the she-wolf. The monumental fireplace, designed and installed by Floriano Ambrosini, also features a fresco of one of the Roman community’s oldest celebrations, the Feast of Lupercal. Statues of Mars and Minerva, two of the deities protecting the new city, rise up on either side of the fireplace in pure white stucco (in imitation of the rare marble from Italy’s Apennines). The sculptor, very probably chosen by the Carracci themselves, was Gabriele Fiorini: he is also to thank for the beautiful bust of Lorenzo Magnani, also in stucco, that stands above the entrance door to the Carracci hall. The same is true of the other busts in an ancient style placed above the door in the loggia, and especially of the large statue of Hercules-Pan in the niche to the rear of the courtyard. Most likely, as has been written, the ancient deity’s head (inspired by a sculpture which at that time formed part of the collection of Bolognese scientist Ulisse Aldrovandi) replicates the features of Senator Magnani. 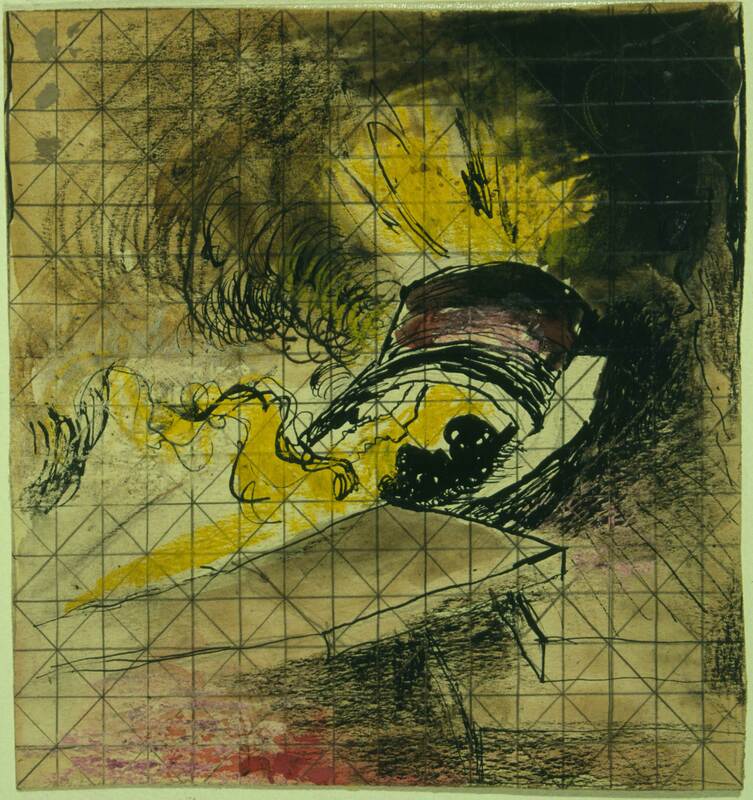 This would also explain the presence of two children at his feet, one in the foreground and the other half concealed. These are believed to represent a legitimate son of the senator hiding another son, who was illegitimate but later acknowledged. 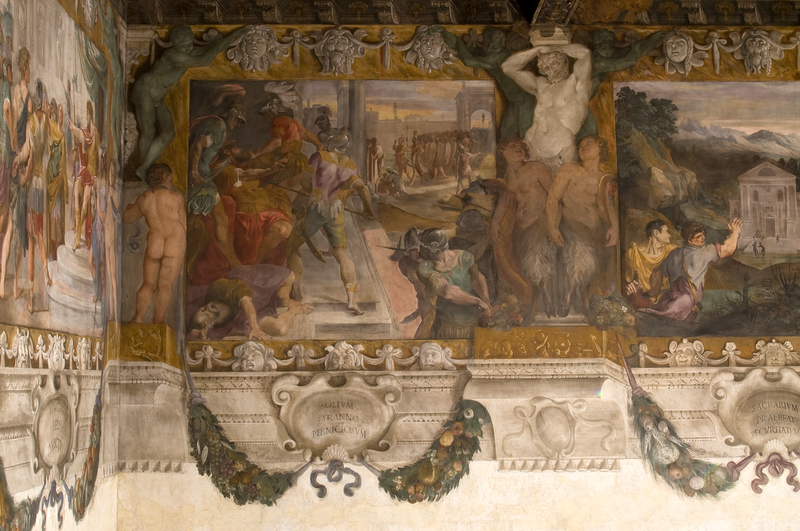 Finally, it is worth mentioning the four frescoes (mentioned by Malvasia and relating to Ludovico and Agostino Carracci) which were originally on the Palazzo Magnani fireplaces but were subsequently sold in 1810 after being detached from the solid wall and which can now be seen at Palazzo Segni, Strada Maggiore 23, the headquarters of the Associazione Commercianti (Retailers’ Association).